Includes Free CD Of The Entire Album & big Booklet. 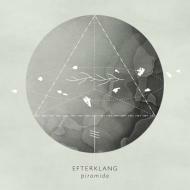 Since 2001 Efterklang has sought to create beautiful music by constantly testing the possibilities in sound, never content to re-tread old paths. The results the Danes have produced so far – most notably across three acclaimed albums, 2004’s Tripper, 2007’s Parades and 2010’s Magic Chairs – have each explored different directions, each an end product of remarkably studied songcraft and emotional resonance. Piramida sees Efterklang exploring completely new territory – literally – on a truly grand scale.